criminal attorney on CNN, Fox, CBS, ABC and NBC. When it comes to family law and criminal matters, it is in your best interest to find an experienced advocate with the capacity to understand your situation and work on your behalf. At Glasgow & Olsson, our experienced lawyers have the knowledge and skill to resolve your criminal defense or family matter efficiently and with your goals in mind. Whether you are facing a misdeameanor criminal charge, such as shoplifting, or a major felony, our attorneys provide aggressive representation when it matters most. Likewise, we are accomplished in representing families in divorce, child custody, property division, and other matters which affect the family dynamic. Family law can often be a contentious area with major repercussions for those involved. The attorneys at Glasgow & Olsson are adept at negotiating your family law matter in order to seek a clear resolution, but if necessary, we will bring our aggressive trial litigation experience to court for you. The attorneys of Glasgow & Olsson have successfully worked with individuals facing misdemeanor charges, drug crime charges, DUI charges, and even murder charges. Our attorneys have over 45 years of combined experience serving clients throughout Cook, DuPage, McHenry, and Lake Counties. Attorney Thomas Glasgow’s background as a former State’s Attorney provides him with a knowledgeable and unique perspective when representing clients during trial. Before he opened the law offices in Schaumburg, Illinois, Glasgow was a Cook County State's Attorney. During this time Glasgow prosecuted cases ranging from DUI, to multi-kilo felony narcotic cases, to murder. Glasgow worked in the Traffic Division, the Narcotics Division, the Juvenile Division, and the Felony Review Division. In all of these departments he tried both misdemeanor and felony bench and jury cases, supervised other attorneys, interviewed defendants and witnesses and helped prepare criminal cases for trial. Attorneys William Blake Beattie and Stephanie Olsson also offer years of experience in criminal defense. Attorney Beattie has successfully defended over 200 criminal bench and jury trials ranging from DUI and drug possession to first degree murder. Attorney Olsson has represented criminal defense clients charged with felonies and misdemeanor in jury trials, bench trials, and at hearings before the court. Our lawyers are equally skilled in caring for you in family law matters. The legal team at Glasgow & Olsson offers respectful representation in the areas of child custody, visitation, child support, high-asset divorce, complex divorce, spousal support, property division, and business valuations. Your family is important to you, and when you bring your case to our attorneys, we will treat it in a manner which is compassionate and reflects your goals. Family law matters may cause either party to feel as if their lives and their children’s lives hang in the balance, and our attorneys will provide you with the representation you deserve and the experience your family needs. Oftentimes, we are able to negotiate divorce settlements without a trial, but if both parties cannot agree we are prepared to aggressively represent you before a family law judge. If you believe divorce is your only option to protect your family and finances, consult our Schaumburg-based divorce and family law office for a consultation. Call 847-577-8700 to see how we can assist you. Former Gov. George Ryan Back Home! Boston Marathon Suspect Dzhokhar Tsarnaev Dould be Facing the Death Penalty!! Contact an Illinois Criminal Defense and Family Law Attorney Today. A criminal defense attorney can greatly improve your chances of a favorable outcome if you are faced with criminal charges. If you need an Illinois criminal defense attorney you will want the law offices of Glasgow & Olsson on your side. Contact us today to schedule a free initial consultation by phone at 847-577-8700 or fill out the online contact form. 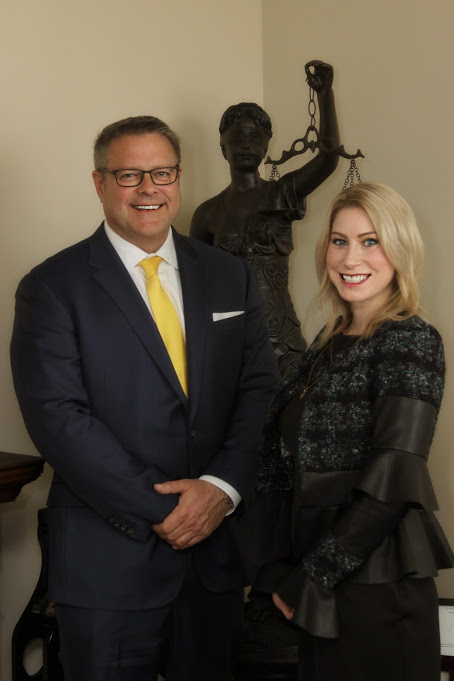 Since founding the founding of the law firm, the attorneys of Glasgow & Olsson have made numerous media appearances as legal analysts across the country. Our law firm has appeared on Fox News National, ABC News Chicago, CBS News Chicago, NBC 5 Chicago News, CLTV, The Mike and Juliet Show, The Talk Show, CNN and Extra. He has also gained extensive news coverage within publications such as The Daily Herald, The Chicago Tribune and Chicago Sun Times. These well-respected media outlets have leaned on our attorneys' experience and knowledge to discuss and analyze high-profile cases such as Drew Peterson’s murder trial, the Jodi Arias trial, the charges against Boston Marathon bombing suspect Dzhokhar Tsarnaev, and Illinois Governor George Ryan’s trial. The law offices of Glasgow & Olsson continue to develop professional knowledge and skill through Illinois continuing legal education, but also work to educate other professionals within the criminal law field. Attorney Thomas Glasgow is an instructor for the Institute for Continuing Legal Education where he teaches a class entitled Defending DUI’s and Related Cases. He also has instructed for Health Care Investigator Training for the Illinois Department of Professional Regulation. Additionally, Glasgow has been a member of the Northwest Suburban Bar Association where he has served on the Board of Governors, Judicial Evaluation Committee, Nominating Committee and as Co-Chair of the Judges Night Committee. Does Use of Over-the-Counter Meds Provide Grounds for Searching a Student?